David Svigel: We find it curious that you’ve built an entire sales strategy and transformation model around curiosity. 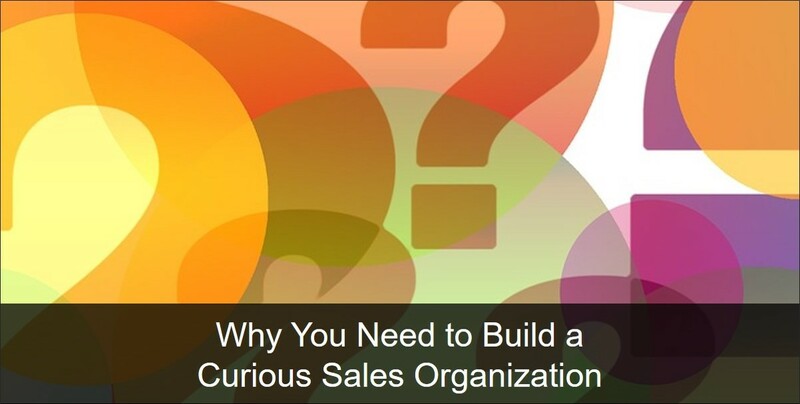 How do you define curiosity and its importance to B2B sales organizations? Alex Berg: Curiosity is an essential skill that every sales professional should cultivate. Buyers make decisions emotionally, and then back up their decision with facts. Curiosity addresses both motivators and solves the two most critical factors in the sales experience: developing rapport and trust with the client and gaining greater access to what the client believes is true. When sales can directly address the client’s truth, they can do a better job pitching the best solution for the client, which in turn reinforces the trust and rapport. But let’s back up and define curiosity. At its core, curiosity is about having an interest in something. There are two primary types of curiosity: epistemic, which is a general thirst for knowledge, and perceptual, which focuses on solving problems. Good salespeople possess both; however, their preference and focus will vary. In addition, people have a predisposition toward being curious about people (social curiosity) or things (mechanical curiosity). Employee tendencies toward epistemic/perceptual and social/mechanical have implications for which roles are the best fit and where they may require additional training. David Svigel: So, what happens when sales people and account managers harness their curiosity? Are there specific outcomes and benefits you have observed with this practice? Alex Berg: Absolutely! Research shows that when you engage in curious behaviors, you release dopamine. A sales rep engaging in discovery feels positive and optimistic. Their questions demonstrate interest and pique the client’s curiosity, which literally makes the client happier. Curiosity also plants the seeds of learning and activates perceptual (problem solving) curiosity. This has been shown to improve incidental learning, allowing you to learn and recall content even when you’re not in conscious learning mode. When the client feels good about working with you, you strengthen rapport and accelerate trust. This shortens the sales cycle and increases sales outcomes by allowing you to sell more comprehensive services to your clients. David Svigel: It seems like the most curious sales reps are the ones that will exceed quota and build stronger relationships with clients. Is it possible to measure a person’s curiosity? Alex Berg: Yes. There are several assessments that include measures of curiosity, including my Curiosity Quotient™ (CQ) that is specific to sales and the business community. Many assessments used by sales and human resource departments incorporate questions about curiosity. However, these questions tend to address general inquisitiveness and a candidate’s skill in asking questions. Because these assessments don’t focus explicitly on the more fundamental aspects of curiosity, they don’t help organizations assign roles and develop learning curricula based on a candidate’s level and type of curiosity. Most curiosity research has been done in academic settings in areas such as neuroscience, artificial intelligence, anthropology and philosophy, and it typically focuses on students and children. It’s intriguing that children between the ages of three to six exhibit more consistent levels of curiosity. Over time, some people retain a strong sense of curiosity and some don’t, resulting in greater deviation between adults. Genetic predisposition is certainly a factor in that it impacts the type and intensity of curiosity each individual exhibits. It’s also important to consider that curiosity can be impacted (positively and negatively) by environment and training. David Svigel: Very interesting. It makes sense then, that in a corporate context, it’s important to assess the curiosity of the organization. How is this done? Alex Berg: There are diagnostics that can assess different aspects of organizational curiosity. Ideally, they work best when used in combination with each other. For example, it is highly effective to conduct structured interviews with clients and folks at various levels in the organization along with 360 CQ™ assessments in which individuals assess their own curiosity and that of their reports and their managers. We can also examine the markers or lag metrics we would expect to see in a curious organization such as retention and service integration for multiple lines of business. And we can examine CRM data to see the extent to which it includes detailed client and contact insights that the organization routinely accesses as part of their standard processes. David Svigel: After collecting and analyzing this data, how do you recommend injecting more curiosity into an organization? Companies also miss tremendous opportunities to inject greater curiosity into their organization as they hire new personnel. Harvard researcher Francesca Gino found that new hires come to the job with a heightened sense of curiosity. However, in most companies, curiosity diminishes an average of 20 percent after six months. This happens in many corporations because people are under pressure to complete tasks quickly at the expense of harnessing the kind of curiosity that leads to innovation. Most leaders claim to support curiosity and innovation but tend to act in ways that favor efficiency and control. This has serious repercussions for sustainable long-term success. The best way to inject more curiosity into an organization is for senior leadership to encourage and model curious behaviors and promote programs that nurture curiosity. From the C-suite to the factory floor, curiosity must be a key cultural more that’s demonstrated on a daily basis. Failure should be an acceptable result if it leads to a meaningful learning experience. Leaders must infuse curiosity into their communications, expectations and management style. Higher levels of curiosity lead to higher levels of innovation when curiosity is part of the culture at all levels of the organization. David Svigel: Are there ways to develop curiosity into a sales technique? Alex Berg: Curiosity in sales is not a new idea; it’s a question of focus. If you’re curious, you will find new ways to solve problems and be innovative. And you’ll improve your own knowledge base and competence by being curious. In the classic business book Helping Clients Succeed, Mahan Khalsa, founder of the Sales Performance Practice at FranklinCovey, contends that focus and intent count more than any sales technique. Your people need to be clear on their intent, which is to help clients solve problems in a way that provides the greatest value. Reps are most successful when they can demonstrate their intent and help clients connect the dots to how their solution delivers value. The magic happens when your reps focus on learning how clients define success instead of just trying to sell them something. David Svigel: As proponents of value selling, we believe curiosity is an integral part of the sales process. What’s your perspective on how curiosity affects the buyers’ journey and the likelihood they will buy from you? Alex Berg: It’s cliché but people really do love talking about themselves. By learning and structuring what you can prior to the conversation, your approach can be truly consultative in that it gets the client thinking and responding in a thoughtful way because you asked insightful questions. They become curious about the questions you’re asking and curious about you. And as the dopamine levels rise, so does empathy, trust and the opportunity to work with the client more efficiently. It’s critical to initiate conversations with enough insight into the individuals you’re working with and the organization they represent so you can trigger various types of curiosity. The old “shoeshine and a handshake” approach is woefully inadequate in today’s sales environment. You need ROI, AI and sales enablement tools that gather enough information about the customer so you can ask questions that hit their hot buttons and makes them curious. An ROI toolkit assesses value at different stages in the buying journey and interjects curiosity into ROI content and marketing-based activities. Buyers need to feel like they learned something from their interaction with you. Continuous education and enlightenment will keep buyers moving through the sales funnel. Curiosity is key throughout the sales process to build trust and remove friction from decision making, thus accelerating sales and profitability. A curious sales organization that uses value selling tools is an unbeatable strategy for improving discovery, building trust faster and accelerating the sales cycle. To learn more about the Curiosity Quotient™ and Alex’s coaching, training and assessment services, call 770-330-6221 or send a message.